Try European Blackjack for a great twist on a classic game! Although many don't know this, Blackjack was invented in Europe! Get to know and love the European version of this game with the variant that the dealer only takes the last card after the player finishes their hand. This type of blackjack has the same basic rules as the regular game. Of course, to start playing you'll first need to place a bet of at least the table minimum. The game also has options for players to split pairs, double down, stand or hit. There is no option to surrender in European blackjack and additionally the dealer must stand on soft 17. Also, players may only double down when the first two cards total 9, 10 or 11. Ready for some action? Play European Blackjack and Start Winning! European Blackjack is game of strategy for players searching for a challenge and lots of fun. European Blackjack follows the same general as in standard Blackjack with a few twists for added challenge. In European Blackjack, at the beginning you are dealt two cards face-up while the dealer gets only one card. The dealer's second card is dealt right after the player has stood. European Blackjack comes filled with amazing payouts and lots of fun for you to enjoy a thinker's game. Play European Blackjack now! The goal of online Blackjack is to get as close to 21 points as possible without going over. At the beginning of each game of each game of European Blackjack, the player makes their initial bet and receives two cards face up and while the dealer only gets one card face up. While playing a hand you may Hit or Stand, Double or Split during your turn, as long as the value of your hand has not exceeded 21. Once the value of your hand exceeds 21, you lose or "bust". If there is a tie your cards get pushed back to you. In European Blackjack the player can only double on hard totals of 9-11. It is very important to always remember that the dealer will always stand on a hand of 17 or better. Do not split pairs of 10's as tempting as it may seem. The risk of losing is far greater than the possible reward. Deal: once you have place you bet, press Deal to be dealt the cards. Hit: press Hit if you want another card to be dealt to you. Stand: press Stand if you wish to play with the cards you already have. Double: press Double to be dealt one more card and double your bet. Split: whenever you get two cards of the same value you may press the Split button to separate the two cards and play with more hands. Slots of vegas Casino offers free European Blackjack online instantly! You can access this classic version of the Blackjack game instantly from your web browser without having to download a single thing! What's more? 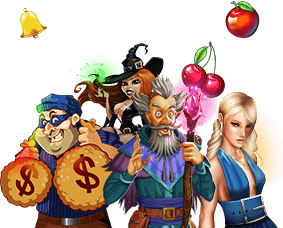 You can play a great selection of casino and free slot games or access the real-money version 24 hours a day, 7 days a week. Play Now!